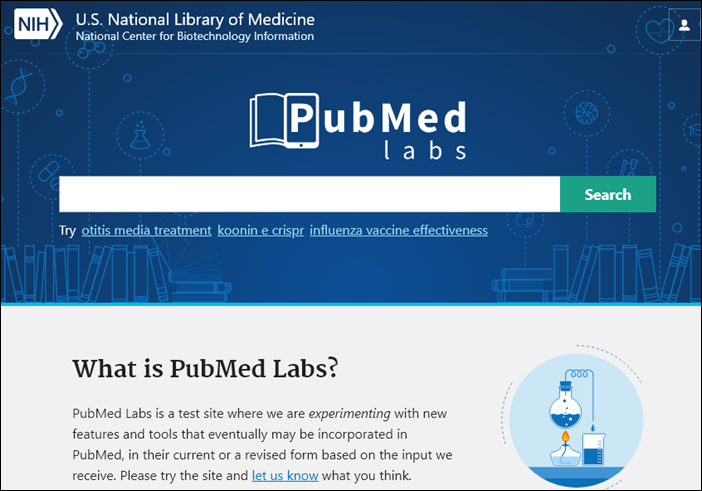 The National Library of Medicine is working on a new interface for PubMed. The new interface will have a more modern look and feel, and will include a variety of new features, such as additional support for mobile devices. This new interface is currently in beta testing over at PubMed Labs and is publicly available. Users are encouraged to try it and provide their feedback. Please be aware, since the new interface is still in development, as of now it can’t replace the current PubMed in content and functionality. The National Library of Medicine has announced that not all new/planned features can be found in PubMed Labs yet, but more and more features are being added. The MSKCC Library is monitoring the progress of these new developments. Once the new PubMed is fully ready for public use, the Library will be offering relevant instruction and assistance. We hope that the new PubMed will provide an exceptional user experience and support the features users are looking for. This entry was posted in Tips, Tricks & Tutorials by Marina. Bookmark the permalink.